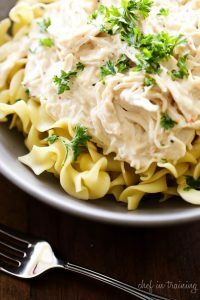 Slow Cooker Creamy Italian Chicken… this recipe is SO simple and packed with the most delicious flavor! It is perfect served over noodles or rice! Now that school is back in session, I am always about the easy dinners. Because when the kids start rolling in the door, just a couple hours before dinner time, things just don’t settle down. To have it already cooking makes my life SO much easier! This Slow Cooker Cream Italian Chicken is one of the easiest recipes you can make! I love creamy recipes and this chicken is perfect complimented with rice or noodles. It was actually inspired from this Creamy Italian Penne Pasta with Vegetables recipe I posted a couple weeks back. I absolutely LOVED the flavor of the dish and decided to make a slow cooker chicken version! Definitely put this recipe on your must make list! It is absolutely DELICIOUS! Place chicken on the bottom of slow cooker. Sprinkle Italian seasoning over chicken. Pour chicken broth over chicken and cook on LOW for 4 to 5 hours. During the last 15 minutes of cooking, add cream cheese and then stir and slightly shred. Spoon over pasta or rice. yes that is exactly what that is! I tried to clarify that in the recipe now, thanks for bringing it to my attention! Do you use frozen or thawed chicken breasts? If they are thawed, how much longer would you need to cook them frozen? Thanks! I used thawed. I would do at min an 1-2 hours longer but it may take more. It just depends how hot your slow cooker gets. Just watch it and let me know what you find :) Thanks! Do I make the dressing or I'm I just putting the dry dressing? Could you possibly use something other than cream cheese?? 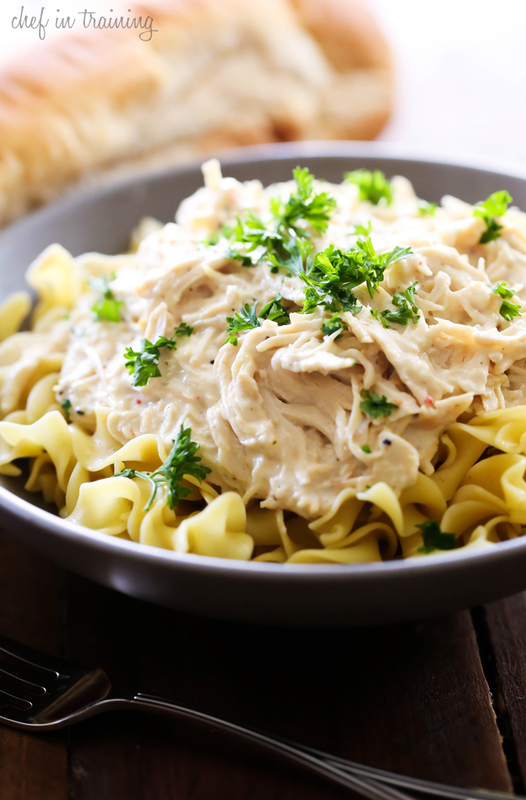 can the Slow Cooker Creamy Italian Chicken be prapared in a skillet. mine burned out and haven't replaced it. Loved this!! I made this for my family last night and everyone went back for seconds. My husband text me earlier and said that he was going home to get some for lunch. No leftovers for tonight! Thanks for a great meal. I always use frozen chicken. Works out great. Maybe an hour longer on low. This chicken recipe is a real winner! Even my picky family had multiple helpings. I served over Reame's noodles (frozen food section) - it really makes the dish. Next time I make it I may add mushroom and carrots for some color and helping of veggies. Thank you ! Can't wait to try more of your recipes! I really want to make this tonight but I do not have any cream cheese on hand. Can I do without it or will it completely alter the dish? Made this the other night and my two kiddos asked for seconds. We all loved it and it was super easy! We added black pepper and shredded parm cheese on top. So good! All three of my kids love this recipe! How many servings would you say this makes? It looks delicious! !